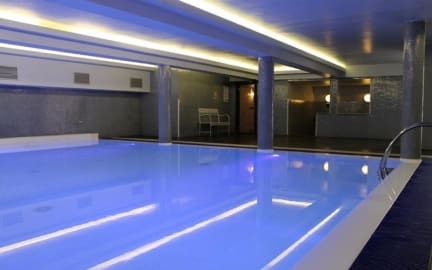 Ci piace che PLUS Firenze offra tanti servizi in loco per gli ospiti, tra cui una piscina, un ristorante e un bar che gli ospiti hanno elogiato per essere 'vivace e colorato'. Questo ostello si trova nella parte settentrionale del centro di Firenze, vicino alla stazione ferroviaria di Santa Maria Novella e a pochi passi dal resto della città. I viaggiatori di Hostelworld hanno detto spesso di apprezzare il personale 'incredibilmente disponibile e cordiale'. Welcome to your home away from home in Florence! PLUS Florence is a unique luxury hostel located right in the city centre and within walking distance to all the top sights, only a 10-minute walk from the main train station. We set the bar for budget accommodation not only in Florence but in Europe as a whole. You'll easily notice the difference when looking at just some of the amazing facilities we offer: an onsite café, bar and restaurant, PLUS Tours travel desk, panoramic terrace, spacious dorms, a flat-screen TV in every room, PLUS Girls (female-only) rooms, Wi-Fi, DJs and more - and that's just the beginning: you can also relax at our outdoor pool and bar (summer only), or in the winter in our indoor pool, sauna and Turkish bath! Jump online and stay in touch with your loved ones as we have Wi-Fi throughout the hostel as well as our own internet access point. You can choose from a variety of room types. Our mixed/shared dorms are light and open rooms that sleep four, five, six, seven or eight people. All beds come with a private reading lamp, crisp white bed linen, cosy fleece blankets and pillows. Each bed has its own storage locker that can be locked. The rooms also have an ensuite WC and shower. The stylish and airy private twin/double/triple rooms sleep two or three people. Beds come with crisp white bed linen, cosy fleece blankets and pillows and the rooms are ensuite with WC and shower. The triple room contains one double bed and one single. Our PLUS Girls female-only rooms have been designed with extra comfort in mind; all rooms are ensuite, bright, airy and stylishly decorated and sleep four, five, six, seven or eight ladies. For those little extra home comforts you get larger bathrooms, a vanity table with mirror, big fluffy towels for use during your stay, hair-dryers, and complimentary welcome cosmetic pack. PLUS Florence has just turned 8! So to celebrate we are giving away a free night to anyone who wants to celebrate their birthday with us. It's very simple: all you need to do is make a booking for a minimum of two nights and as long as your birthday falls on one of those days we won't charge you for that night! The offer is not valid with any other promotion or offer. Upon arrival, booking reference must be presented with a valid form of photo I.D. Not valid for double or twin rooms (so, dorm rooms only). And that's it - we told you it was simple! Our all-you-can-eat breakfast buffet is available for just € 7,50. It includes both hot food and continental options. The city tax in Florence from January 2018 will require a contribution of € 2.00 per person per night and it will be paid in cash by the guest. Can't find availability at PLUS Florence? Then head on over to our sister property in Florence: PLUS Camping Firenze, also bookable on Hostelworld. Experience the PLUS difference at these other great locations in Europe: PLUS Berlin, PLUS Prague, PLUS Camping Roma, PLUS Camping Jolly (Venice). Please read our Things to Note below before making a booking. Amazing place, the girl with the glasses and brown hair at the reception was super helpful and extra nice. This is not a Hostel. Is a PLUS hostel!! There is no Kitchen!! But the room is amazing! Stanza doppia piccola, richiesta con letti separati, fornita con letto matrimoniale. Materasso duro, storto e globalmente scomodo. Bagno minuscolo. Prezzo elevato. Staff is very rude . Everyone. everything else very well. Para lo que pagué estoy inconforme. A mi llegada el personal poco amable, las habitaciones algo viejas, los armarios ni hablar. Poco espacio entre las camas. Es una estructura antigua. No volvería. Credo che gli aspetti migliori del nostro ostello siano i servizi extra, quali la piscina all\'aperto in estate, una piscina coperta in inverno, una sauna in inverno, e un ottimo bar e ristorante. Quanti backpackers possono dire di essere stati in un ostello con una sauna e una piscina? L\'ostello è situato in posizione ideale, con The Academia ad una breve distanza a piedi. Il Duomo è anche molto vicino. Nessuna visita a Firenze è completa senza una visita alla Galleria degli Uffizi - ricordatevi di prenotare in anticipo per evitare le code. Offriamo anche serate a tema come il toga party nel nostro bar e ristorante Opera. Non perdere le nostre bevande a basso costo durante l\'happy hour! Ospitiamo un mix di età nel nostro ostello, con la maggior parte dei viaggiatori tra i 18 e i 40 anni. Personalmente trovo che sia molto facile per i viaggiatori conoscere altra gente e riunirsi nelle aree comuni. Infine, abbiamo alcune camere specifiche per le persone con disabilità, nonché ascensori e rampe che sono sempre disponibili in caso di necessità.